So I hit the trade show at Connections the last couple of days. This was my first time there. Met a few people from various boards, went to a small get together and had an enjoyable evening. The trade show itself was interesting. Not much there for VLM cleaners, but there were some nuggets. For instance, I got to meet the legendary John G. Both he and his son are really nice guys and it was great to test drive the Trinity and Profit. I was impressed with the Trinity. We ran it on speed 3 and there is no doubt that it has a lot of power. I also tried out the Profit. Really liked how it felt. Incredible amount of control for a wheels up machine. There was mention of a new cotton/terry pad being developed, so that's good news. Again, professional guys and great machines. Another vendor, part of a rug cleaning business, had a Defender/CX on display. Really wanted to try it out but they did not have it hooked up. Machine looked good though. Mytee had an interesting machine that they unveiled. It's a modular unit that can be stacked as needed. 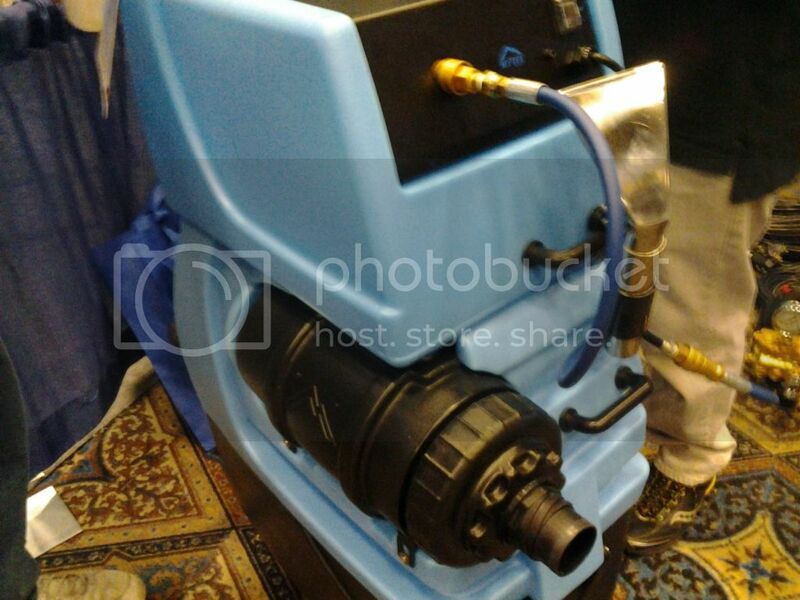 What it looks like is an Air Hog Plus with an optional pressure washer box that can be attached to the top. An Interlink rep gave me a kindly lecture outlining the benefits of using a CRB compared to an OP and how I am really missing out just using a CRB exclusively. As far as I am concerned he was very much wrong in both opinion and fact, however I was not going to argue with him. It's not that he looked down on OP or VLM cleaning, he just didn't know any better. Decent guy, just had no idea when it comes to VLM. Regardless, the CRB is a nice machine. I would like to find a mid sized unit. Would be a nice tool to have. I also took a long look at the Dirt Dragon. Pretty big investment, but it looks great and I think there is a growing market for hardwood floor cleaning. However, there are probably less expensive alternatives to get that service going. Still, I think if you're busy enough that might be the go to machine. Also checked out some vent cleaning equipment. This is something I have kicked around in the back of my head for a while. However, the process upon closer examination looks like a potential pain in the arse. Lots of vendors selling air movers. Lots. In fact, the most displayed items were air movers, wands, and portables. As much as the show is about carpet and general floor cleaning there almost as many vendors promoting restoration related products and services. The convention floor had about 3/4 of the space filled with vendors. However, the traffic seemed slow to me. This of course is coming from a guy that has never been to the show, so I could be way off base - but it didn't seem to be at crowd capacity or even close to it. Talked to a few guys here and there about padcapping and how we clean. They looked at me as if I had forgotten the english language and started speaking pure gibberish. They were beyond a doubt bewildered. Were they using that Mytee set up for tile & grout? No. The pump box tops at 250 psi. They have the LTD5 or whatever it's called that I think goes to 1200 psi? If I were to get one for T&G I think it would be the Breeze. Seems to have everything you would need....well almost everything - except heat. (09-06-2012, 09:01 PM)Rug Beater Wrote: [ -> ] Were they using that Mytee set up for tile & grout? Damon, I was there 2 years ago with Coby even present. I like your report & concur that you start talking OP with most & you get the deer / headlight look. I will likely be there next year. Clark of Defender /CX is too busy with rug stuff now to be bothered with OP stuff IMO, to my knowledge rarely returns phone calls with clients having concerns with their machines is what I hear. But if you were buying rug equip, he'd be all over thaaaaat! Glad you went! Anyone else here go? I didn't, but have heard some murmurings that this may have been the last Connections.??? John and his son stopped by for lunch last Saturday. When the discussion got to Connections he said he thought this would be his last one he had a booth in. He said it just keeps getting further away from carpet cleaning and he thinks they should have two events. One for carpet cleaners and one for restoration. He was not real happy with the focus on restoration and less on carpet cleaning of any method. Would be nice if everything were under one roof. There is as much to see at a show like this as there is at Connections. I wonder if the slowdown in attendance has as much to do with the economy is as it does with the fact that more and more homes have less carpet and more hard surface flooring? (09-07-2012, 07:45 AM)Richardc Wrote: [ -> ] John and his son stopped by for lunch last Saturday. I wonder if it isn't just the lack of value in the programs. Way too many "pay me, to listen how you can pay me more to get my program." People are tired of informercials! did you walk out to truckmount alley by chance? I recently order Howard Partridge round table 19 series this past winter when it was on sale for $200 USD. I listened to all 9 or 11 CDs whatever there was. I can say there was very little concrete 'do this' or 'this is the form' that make your life easier etc. There was plenty of - you need to get this system in place - but nothing more concrete after the suggestion. It makes me glad I did not pay the $1000 to get in the door, + the 2000 I'd pay to fly, & eat on top of the 1000. I am in no way saying the CDs are useless, matter of fact his sermon on the ?8 steps to a better L.I.F.E. (his new book) was utterly awesome - but has very little to do with my cleaning biz operations. TO someone who has never heard much of this type of biz training, it likely has huge value. But after 25 years now, I have heard most of it being preached already. It is just that SFS, has all of this stuff & a whole lot more - and here is the form, here is how you fill it in, here is an employee manual -here is how you use it, here is step by step how you take a noob to senior tech in 10 days -and here is how you use it, here is how you need to figure out what you need to charge for your services - and this is how you use it, etc etc etc etc... there is just sooooo much more to SFS than there was to the round table 19. HP RT19 series was worth $200, just not worth 3K to attend in person. His new series with Tom Zigler is interesting, & I would likely go for $3 -400 invested, but not for $600 either - incl travel - unless I was going to the area for some other combined reason. I checked out TM alley and it was just that - an alley. Not a lot going on out there. I did see the T-Rex and it looks just like the HOSS unit from what I could see. (09-07-2012, 02:03 PM)cleantech Wrote: [ -> ] did you walk out to truckmount alley by chance? I think you're right. That probably has a lot to do with it. Keep in mind though that I did not attend any classes, floor (free) show only. (09-07-2012, 01:48 PM)Richardc Wrote: [ -> ] I wonder if it isn't just the lack of value in the programs. Way too many "pay me, to listen how you can pay me more to get my program." People are tired of informercials! Quote: I think you're right. That probably has a lot to do with it. I think the majority of people do the same. The education portion turned into little more than a bunch of infomercials. They said this year was even worse. Rumor is this might be the last one. I doubt it but it could be the last of this format. Seems to me that in the past Connections was the type of event a guy would take his wife to and call it a vacation. Stay a week, do the tourist thing, go to a day or two of Connections and write it off. The whole thing seems pretty useless to me, however, if I lived in Vegas or Clearwater I'd at least check out the trade show. I'd skip the other stuff though cause it just seems like infomercials. As a VLM cleaner I can't see any reason to spend $$$ to attend, just a waste of time and money. I couldn't get motivated about anything at the show. I did like trying out the Trinity and Profit, but aside from that nada. On a side note the local Interlink store had a little get together at their store today. Some sort of post convention party. I had never been there. We get everything from Vacaway and Jon Don with a smidgen at a local independent supply house. They were offering free food so we decided to make an appearance. Thanks for the report D!!! I wish I could have gone to put some faces to the names I see on here. I think Mytee is going in the direction with the modular setups since I don't think guys need 300+cfm/200' ft hose run portables? The only problem is that the modular machine was still huge lol! Just like you and I have talked about, they need to make a small tight unit. Small enough that it doesn't need dual motors and the user can run it on a 25' hose run. A single three stage or something. No waste or fresh tanks so it's small and compact. Short hose run. Add heater and pump. I just don't understand why anyone has done this yet. (09-08-2012, 11:37 PM)Lefty724 Wrote: [ -> ] Thanks for the report D!!! Con I totally agree with you. Howard has a lot to offer if you're a new guy but not much there for someone who has been around the block. SFS is the best value regardless, so much for the money, in fact free if you spend enough with them. (09-09-2012, 02:51 PM)thecleaningdude Wrote: [ -> ] Just like you and I have talked about, they need to make a small tight unit. Small enough that it doesn't need dual motors and the user can run it on a 25' hose run. A single three stage or something. No waste or fresh tanks so it's small and compact. Short hose run. Add heater and pump. To a degree, I agree with you. HOWEVER, what I would really like to see is a portable that has two of those new highly efficient vac; motors, a 300psi pump, auto fill/empty, a five gallon solution tank and a continuous pump out motor. I could forgo the heater for dwell time and agitation, + a fifty foot 2" vac; & solution hose. It would need to be more of an upright machine with a bubble dome instead of the screw-on lid, and large pump-up tires at the back to make it easy to take upstairs. Locking front castor wheels to stop it rolling around. I say upright, because all of those machines that are shaped like the Rotovac CFX with Docking Station, (only as an example), are to heavy over the front to safely take up stairs. I would also like to see all hose connections at the front of the machine, probably down near the base. Switches could be mounted near the top, even on the side. This would make it simple to leave in the van and all switches/hoses, etc; easily accessed by the operator. Instead of electric leads hanging everywhere, install a couple of caravan type male plugs that have a hinged flap, then extension leads could easily be plugged in. You would then have one Mytee machine.